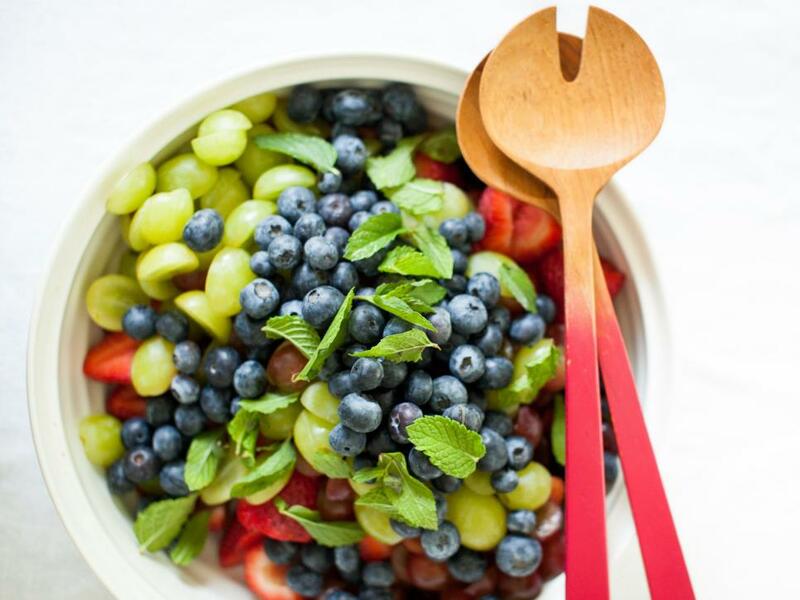 Put your best fruit forward! 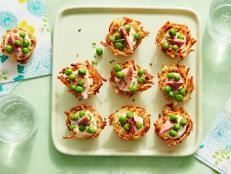 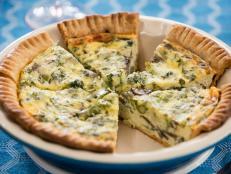 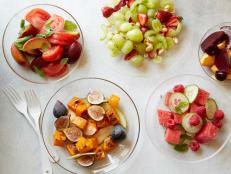 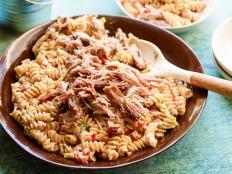 See the best ways to mix up produce, syrups and spices for fresh fruit salads that won't fall flat. 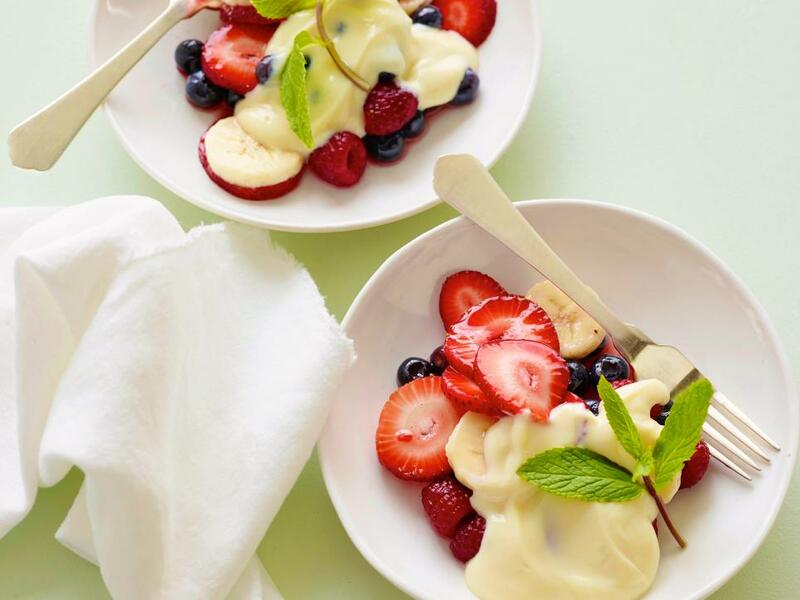 Spike your fruit salad in the classiest way with Ina's limoncello-infused berry and banana salad. 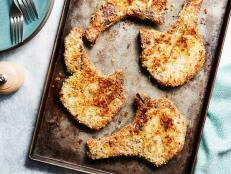 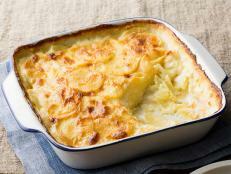 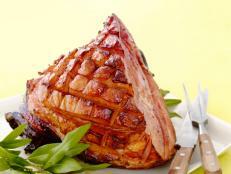 Don't forget a dollop of the bright lemon curd and yogurt topping. 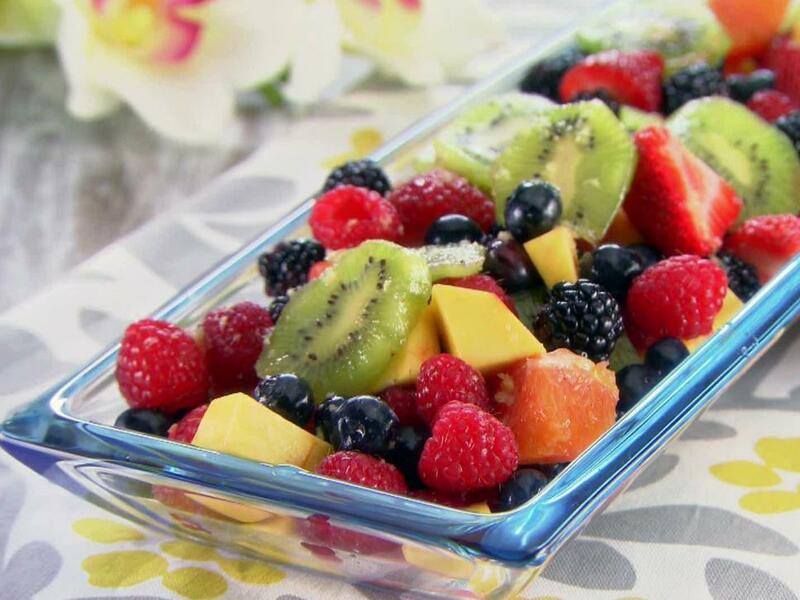 If you need a make-ahead dish, a fruit salad is the way to go. 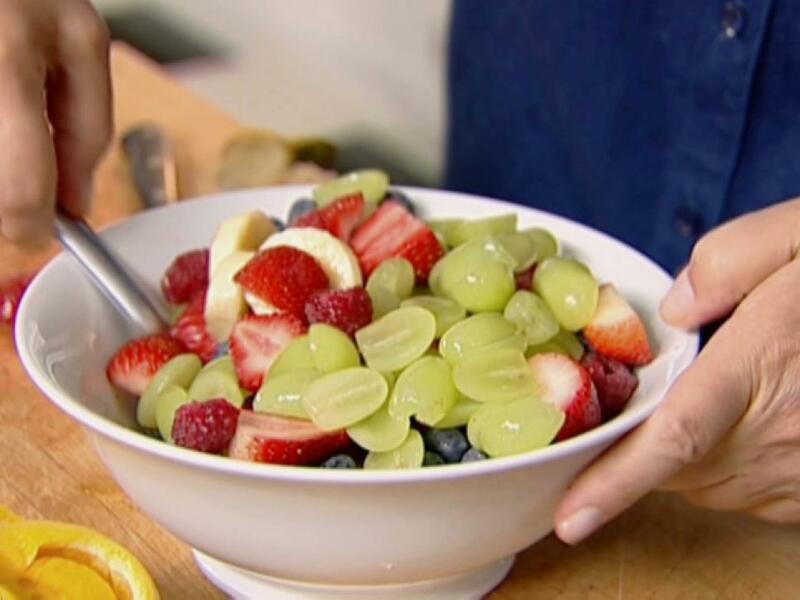 As Ree notes after dressing this fruit salad with homemade orange-vanilla syrup, "it only gets better as it sits in the fridge." 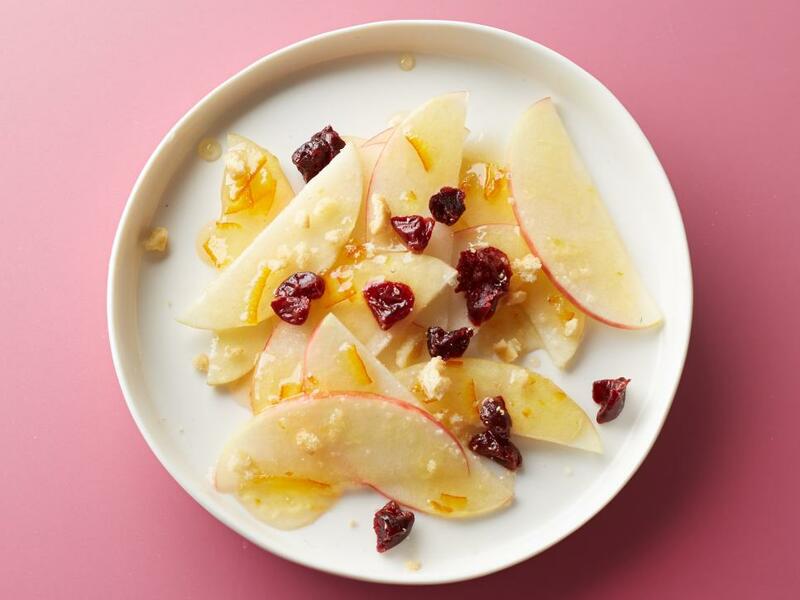 Ina gussies up fruit salad in a snap with a quick yogurt topping, mixed with good honey and vanilla extract (add vanilla bean seeds if you're feeling extra fancy). 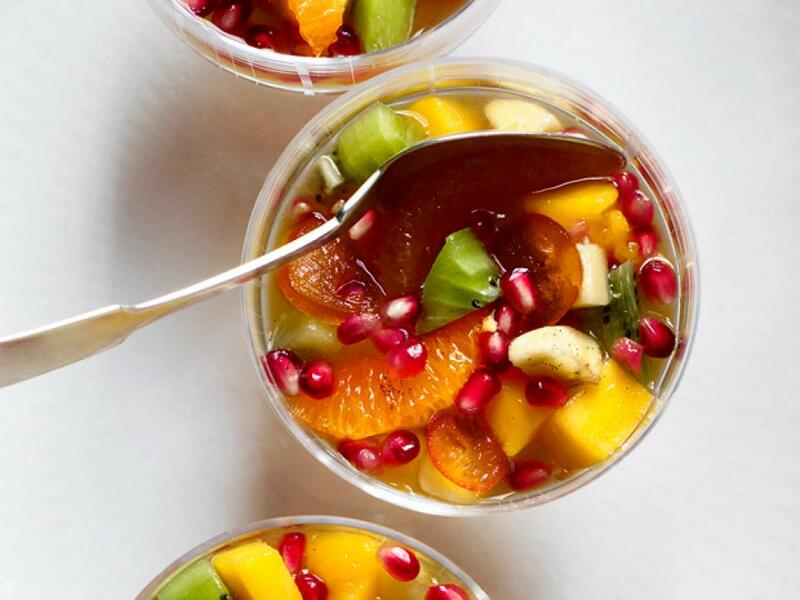 For a flavorful fruit salad in the winter, look to a mix of in-season produce — like citrus, pomegranate and kiwi — and fruits available year-round, like bananas and mangoes! 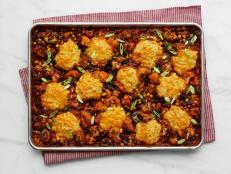 Although some fresh fruit is a must, pantry foods of the canned and dried variety are a great addition when fruits are less accessible, or to add texture. 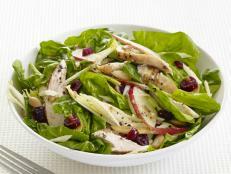 Sunny Anderson blends fresh apples and honeydew with canned pineapple and dried cherries in a creamy dressing for an easy fruit salad in just 10 minutes. 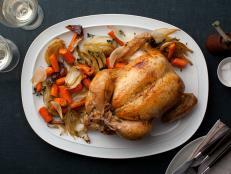 As beautiful as it looks, the real "radiance" in this Ellie Krieger recipe comes from the healthy qualities of the fruit it contains. 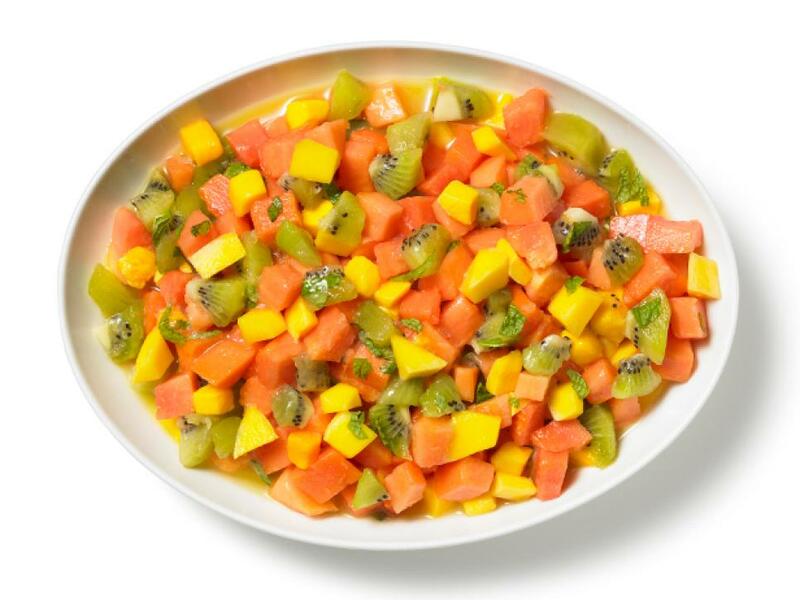 Cantaloupe, strawberry and kiwi serve as an excellent source of fiber, folate, manganese and potassium, as well as vitamins A, C and K.
Wow the crowd with Ree's eye-catching citrus salad, which calls for a sweet and savory dressing with Dijon mustard, honey, orange juice, champagne vinegar and olive oil. 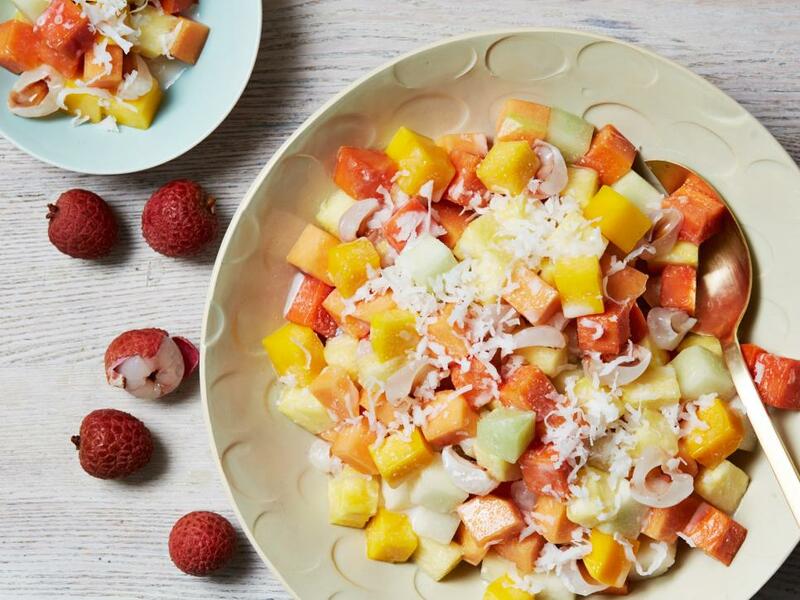 Take inspiration from the tropical destination of Bali with a bevy of island fruits tossed with a refreshing coconut milk-and-lime dressing. 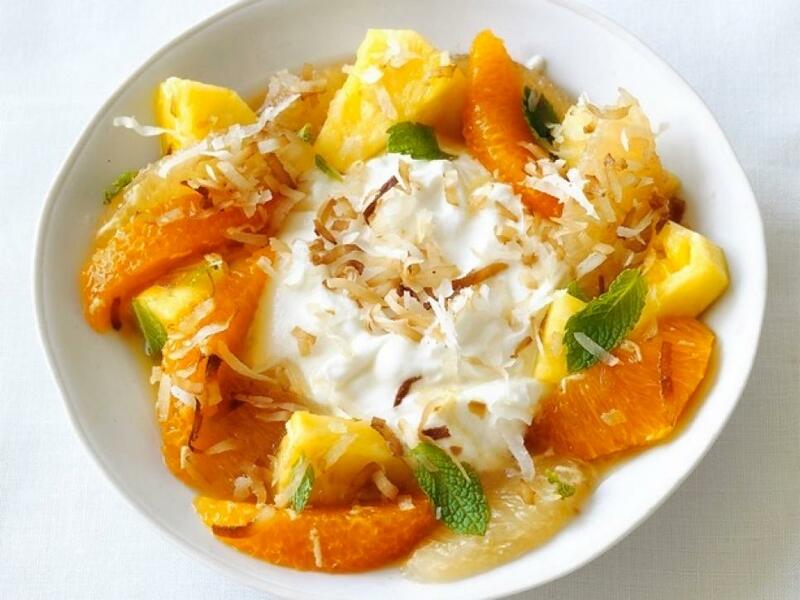 Sneak a bit of coconut-flavored rum into this honey-ginger fruit salad and raise your fork for a toast. 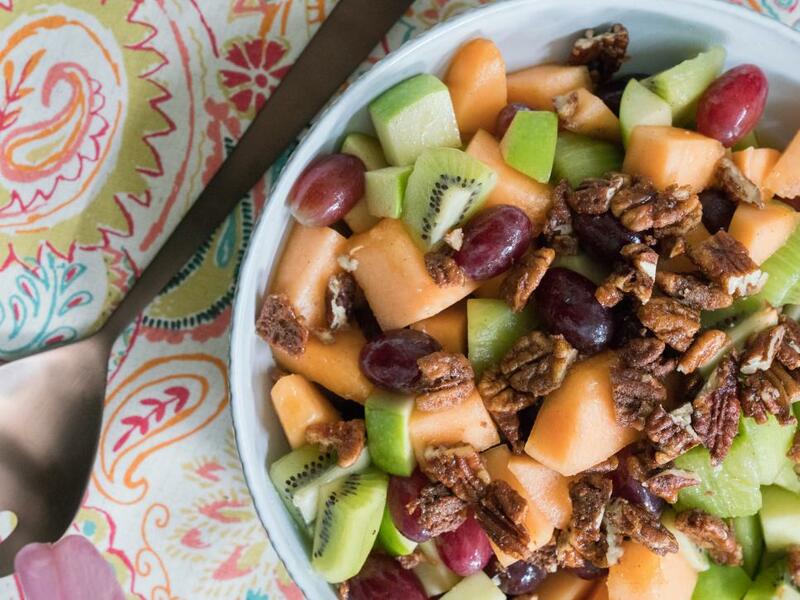 Sweet meets heat in two ways for Trisha's fruit salad recipe with spicy roasted pecans and a habanero-infused honey syrup. 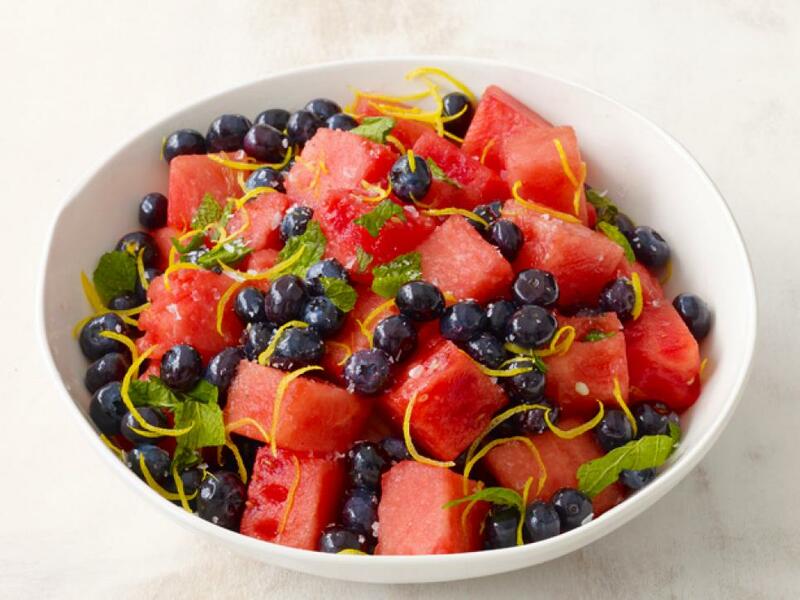 Dress up a bowl of watermelon with a refreshing lemon-mint syrup, blueberries and a pinch of salt. 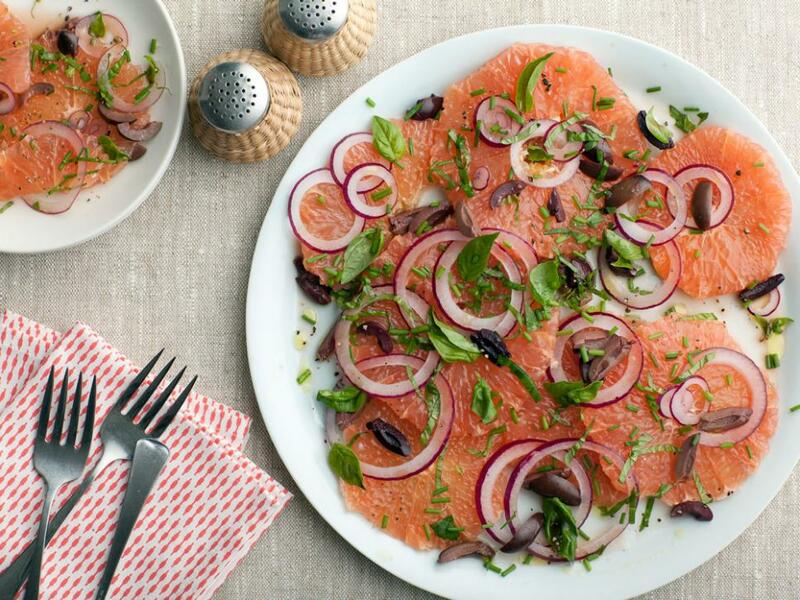 Giada's savory grapefruit salad features a bright balsamic dressing, briny olives and refreshing herbs, making it a bright and fresh palate-cleansing dish alongside heavier mains. 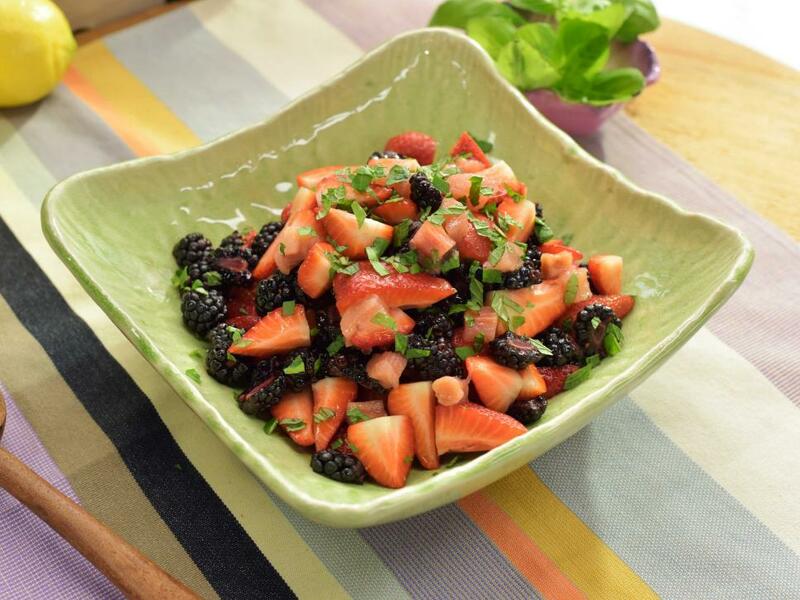 Inspired by a trip to Hawaii, Trisha Yearwood uses a mix of berries and tropical fruits with a ginger-lime honey dressing, for what she calls "a tropical vacation on a plate." 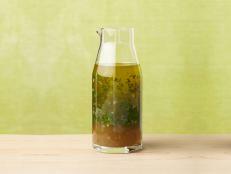 In this spring-centric recipe, a sweet and tart rhubarb syrup marries perfectly with the flavors of fresh strawberries, blackberries, basil and mint. 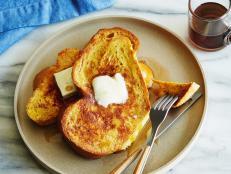 Tip: Save any leftover syrup to use in a homemade soda or cocktail! 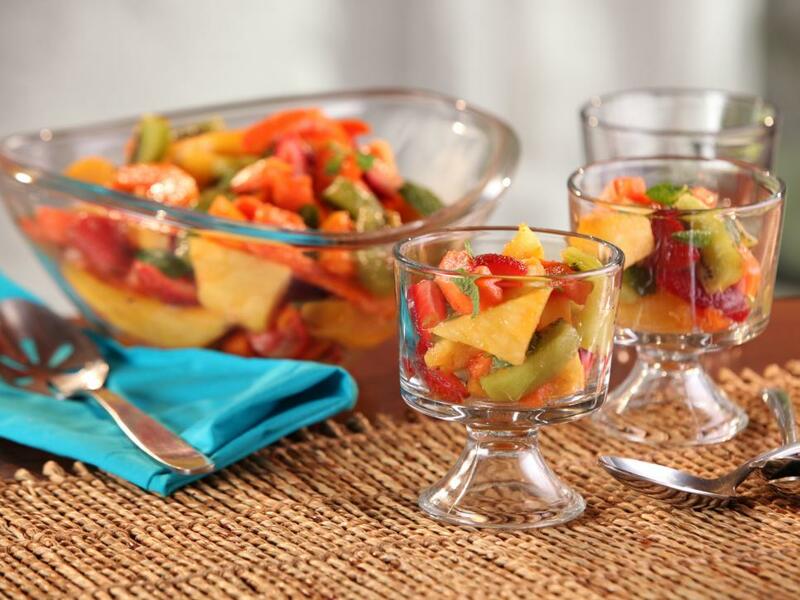 Bobby mixes up tropical flavors in this colorful salad with mango, kiwi, papaya, pineapple and a ginger-lime syrup. 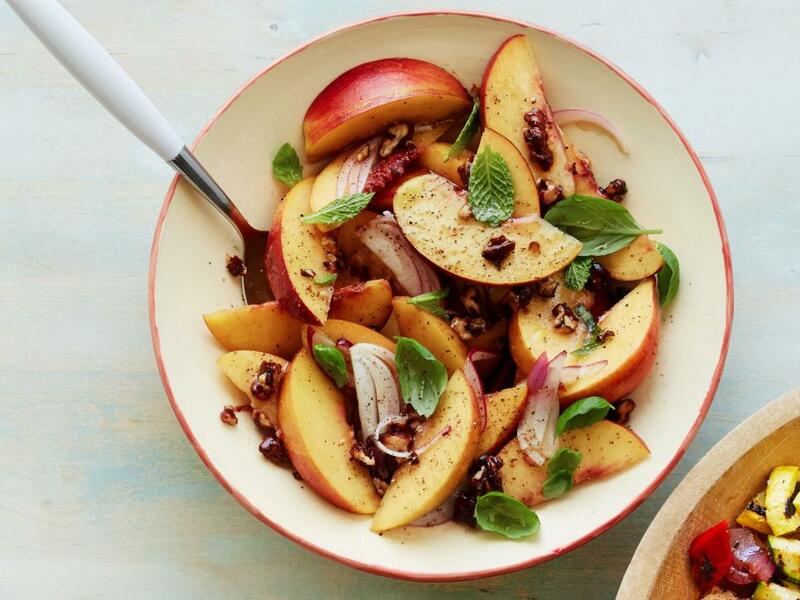 Fresh peaches shine in this savory salad with a bright vinegar dressing, a sprinkle of salt and pepper and herbs. 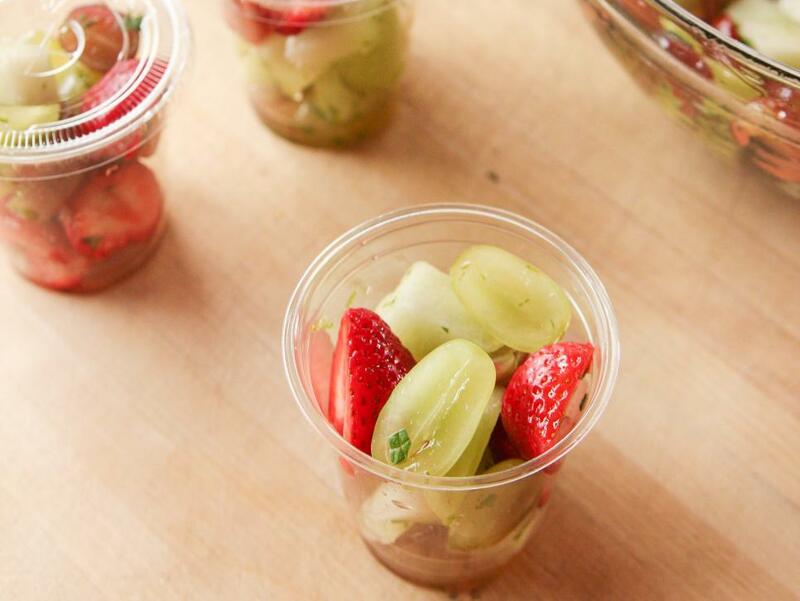 This may look like your average fruit salad, but it comes with a cowboy twist thanks to a drizzle of spicy-sweet jalapeno-lime syrup. 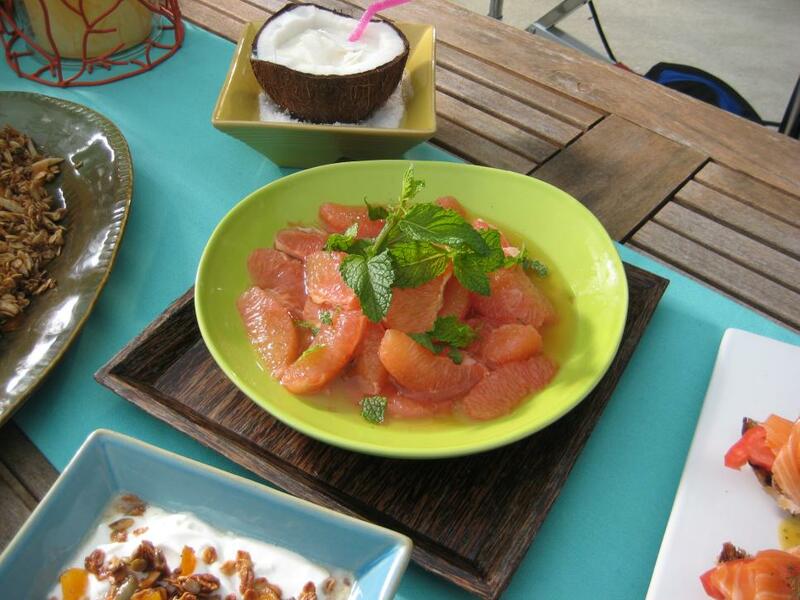 Keep things simple but flavorful, Bobby Flay-style, by dressing grapefruit segments up with a mix of honey and fresh mint. 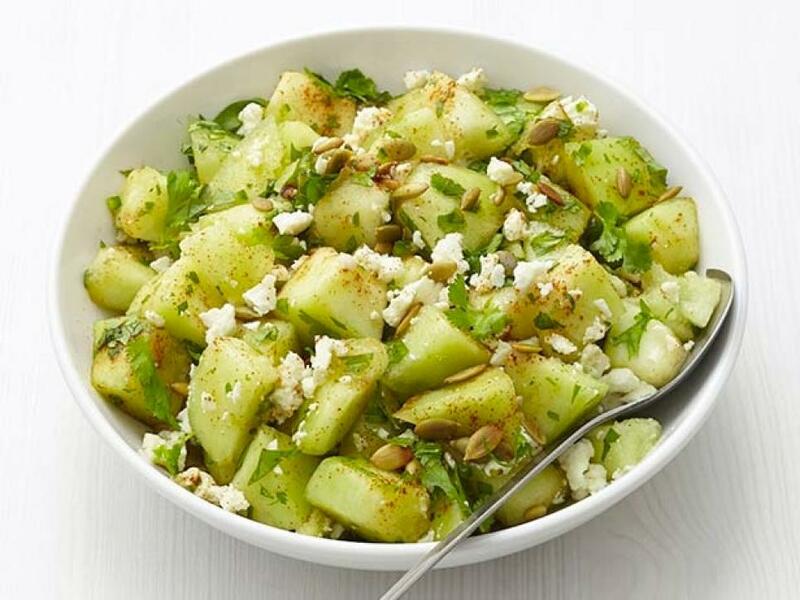 FYI, cucumber is actually a fruit (it has seeds!). 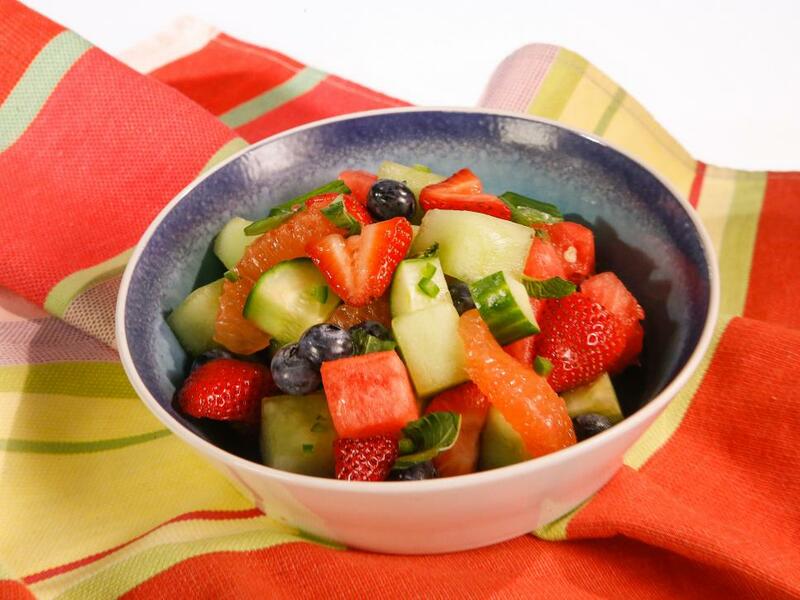 Here, it joins its fellow fruits to add a refreshing crunch to an otherwise sweet salad with a drizzle of jalapeno, lemon and honey dressing. 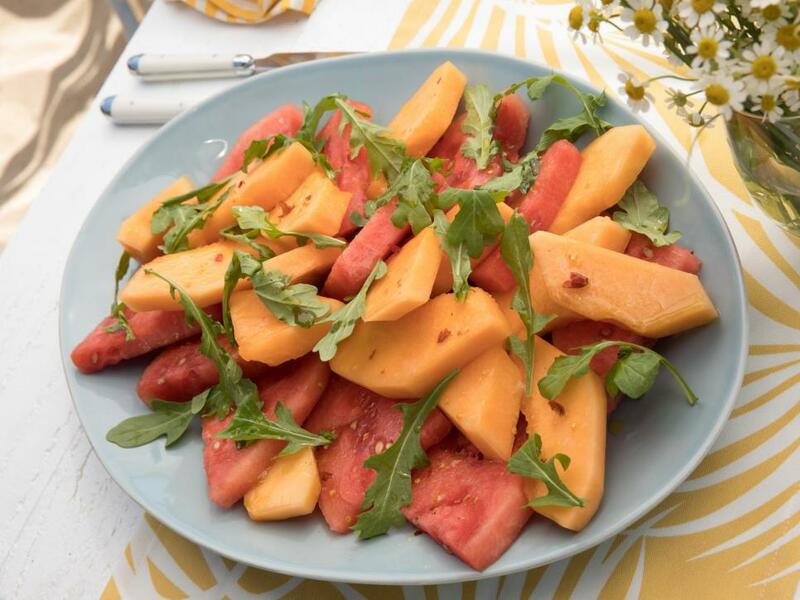 Giada skip syrups altogether in this recipe and uses melons to build a colorful side salad with arugula, dressed simply with olive oil, lime juice, pequin chiles and sea salt. 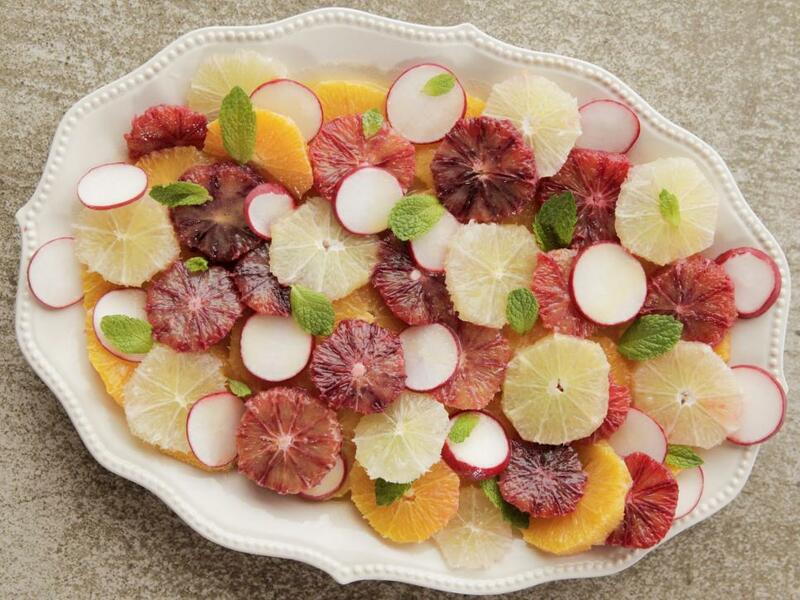 Bobby's citrus salad is the perfect make-ahead dish for brunch. 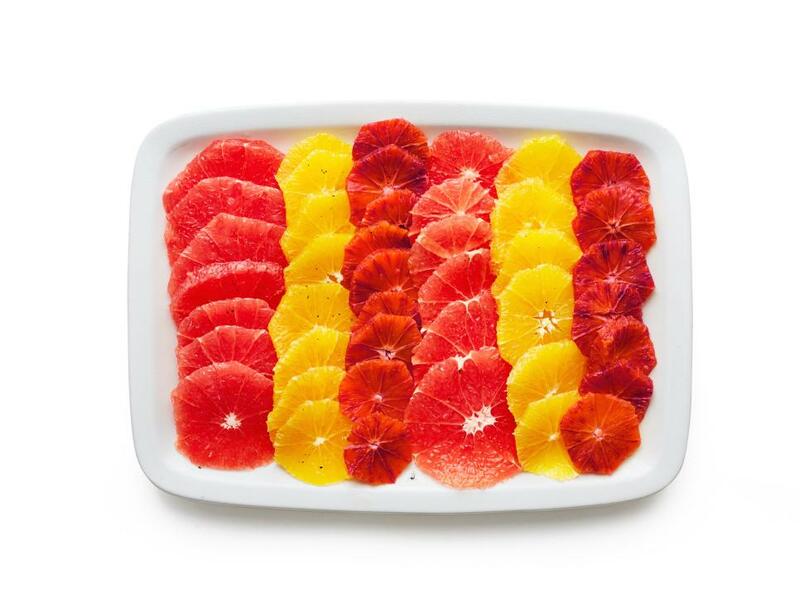 Macerate segmented grapefruits and oranges in a honey-ginger syrup for at least an hour before serving with a streusel-like topping of almonds, mint and sugar. 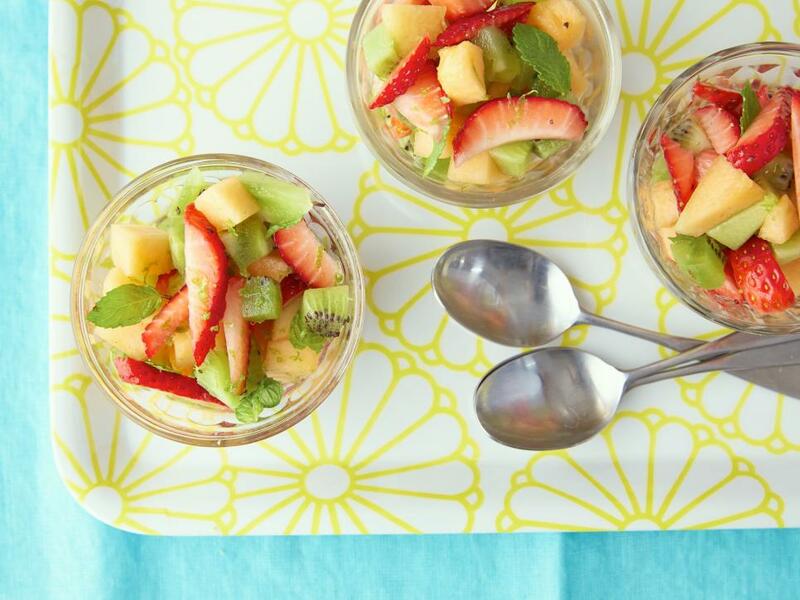 A fruit salad by any other name tastes just as sweet. 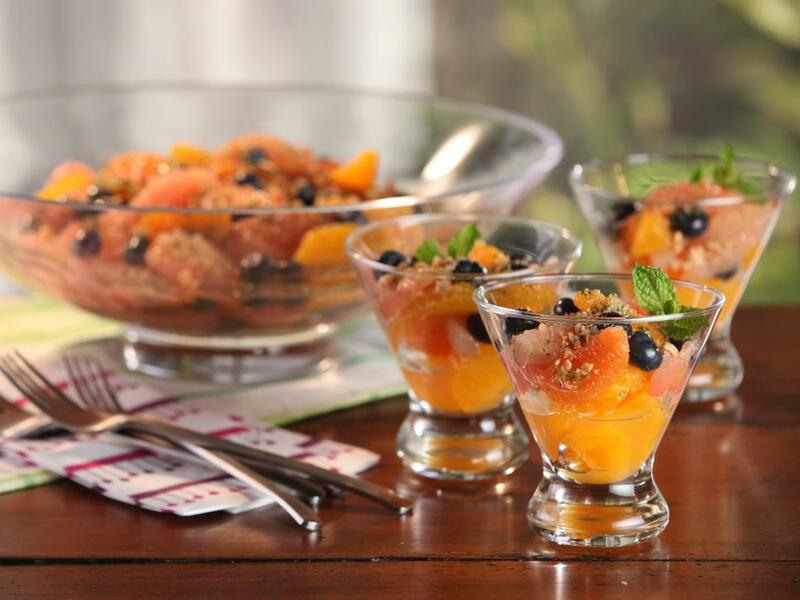 In his fruit salsa recipe, Aaron Sanchez mixes diced kiwi, mango and papaya with orange juice and mint for an easy dish that's extra scoopable. 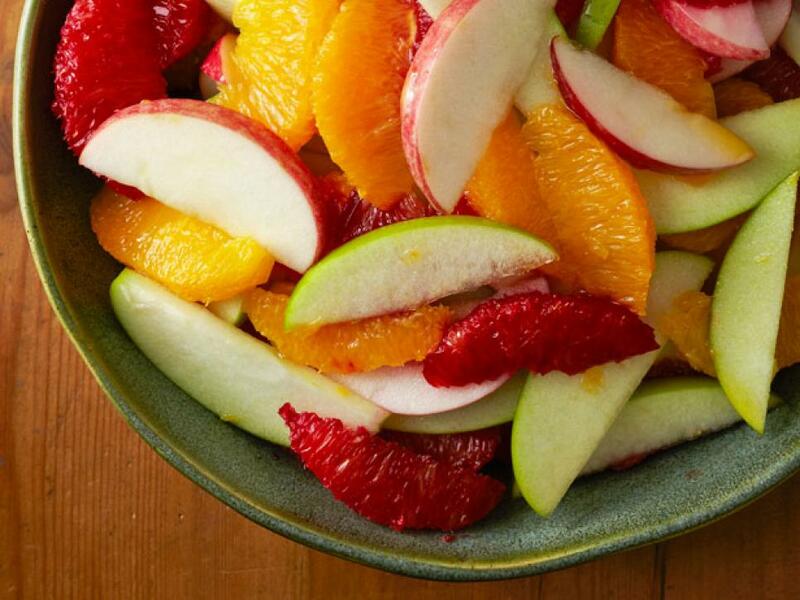 Apples and oranges might be hard to compare but they pair up perfectly when sliced up for a fruit salad. 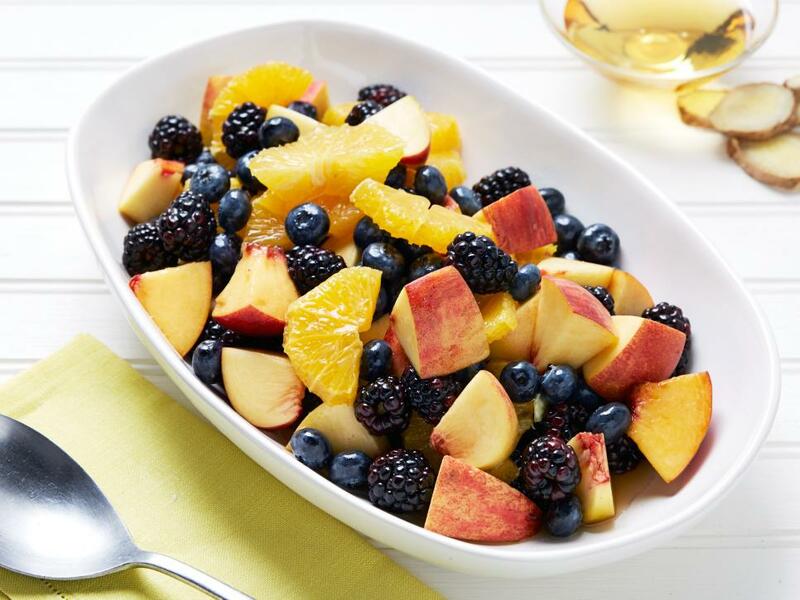 Enjoy a tart fruit trifecta with grapefruit, oranges and pineapple slices — plus a dollop of creamy cottage cheese to help balance out flavors. 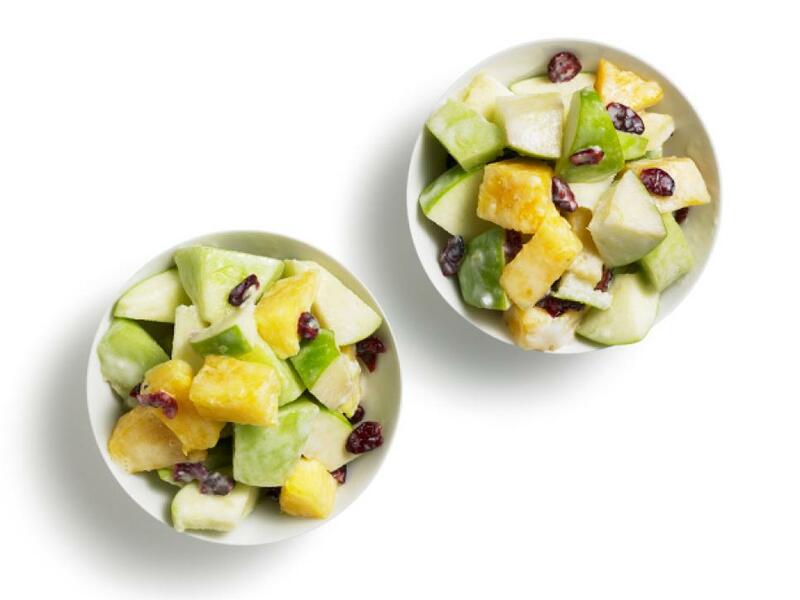 Classic Mexican ingredients — lime juice, jalapeno, ancho chili powder and cotija cheese — help liven sweet bites of honeydew with a flavorful blend of sour, spicy and salty accents. 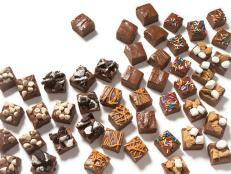 There's no need to bake for the dessert course. 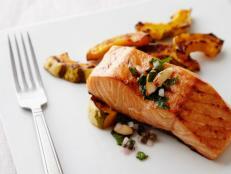 Instead, serve up a party-ready platter with a variety of citrus fruits, sliced into eye-catching cross sections and dressed with a lemon-vanilla syrup. 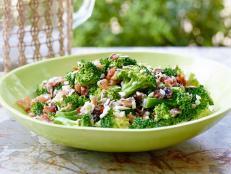 Orange marmalade, almond extract and dried cherries make a deliciously perfumed and slightly sweet dressing for this dessert salad. 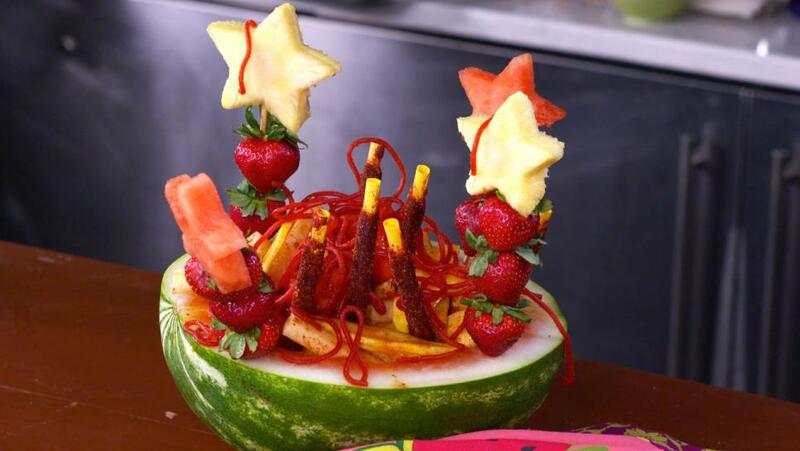 Spanish for "crazy watermelon," this Mexican street food is a sweet-salty-sour-spicy fruit salad to the extreme. 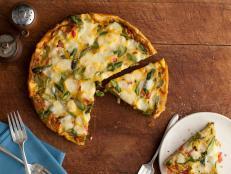 No guac here! 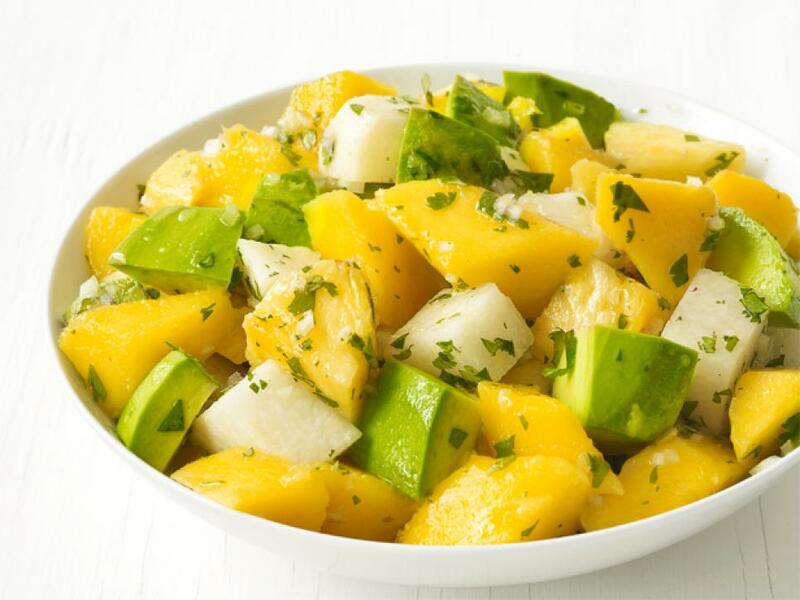 Chunks of avocado (also a fruit) add creamy texture and savory flavor to this salsa-like fruit salad with pineapple and mango. 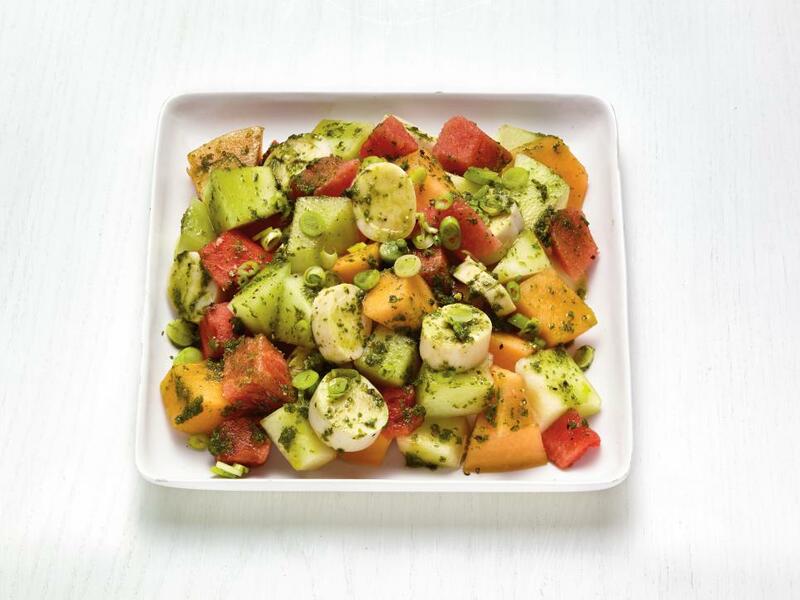 Sweet melon slips easily into a savory role once more in a side salad made with hearts of palm, serrano chile and scallions.